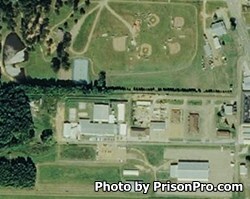 Leake County Correctional Facility is located Carthage Mississippi. It is a medium security prison that houses both pre-trial inmates and long term state commitments. The current capacity of the facility is 460 adult males and females. Inmates are housed in multiple occupancy dorms, single and double cells depending on the security requirements of the offender. Inmates are provided with recreational activities that include volley ball, basketball, cards and board games. Offenders at Leake County Correctional Facility can receive individual counseling, pre-release counseling, and substance abuse treatment. Inmates can also earn a GED and adult basic education while incarcerated. Vocational skills taught to inmates include carpentry, and computer courses. Inmates can have up to six visitors at one time. Visiting hours for State Inmates are determined by the inmates assigned dorm and the first letter of the inmates last name. Inmates with a last name A through L have visits 8:30am-11:30am, inmates with a last name M through Z have visits 12pm-3pm. Dorm B-11, C-26, and C-27 have visits on the first Saturday and third Sunday of each month. Dorm C-30 and C-31 have visits on the second Saturday and fourth Sunday of each month. Dorm C-34 and C-35 have visitation on the third Saturday and first Sunday of each month. Dorm C-11, C-38, and C-39 have visits on the fourth Saturday and second Sunday of each month. Visiting for County Inmates with a last name A to L have visits on the first and third Saturdays of the month. Inmates with a last name M to Z have visiting on the first and third Sundays of the month. All females have visitation on the second and fourth Sundays of the month. All county inmates have visiting hours from 3:30pm-5pm.